For reading books and articles, or watching videos, Joy loves to hold her iPad. But if the urge to write a long letter strikes, there’s nothing like a physical keyboard. 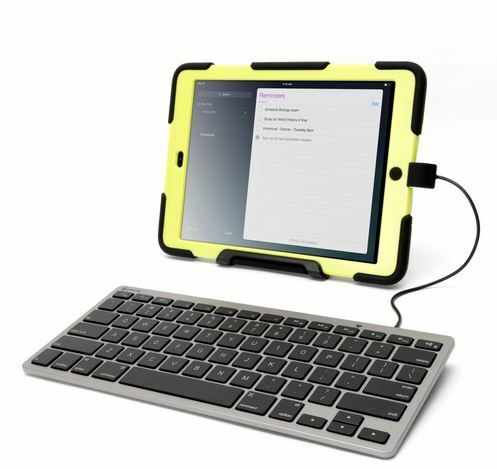 Our favorite is the new “Wired Keyboard for iOS devices,” $60 from Griffin Technology. It’s about three-fourths the size of a regular computer keyboard, but still easy to type on and small enough to carry in a tote bag. We found we had to press a little harder than usual to make capital letters, but otherwise it felt as good as other keyboards. Having a wired keyboard can be better than going wireless. You don’t have to pair it with your Bluetooth connection, or worry about batteries. It’s especially handy in classrooms where new rules require the use of keyboards not connected by Bluetooth during standarized tests. It’s hard to believe but some people might use a wireless connection to get the answers from an outside source.